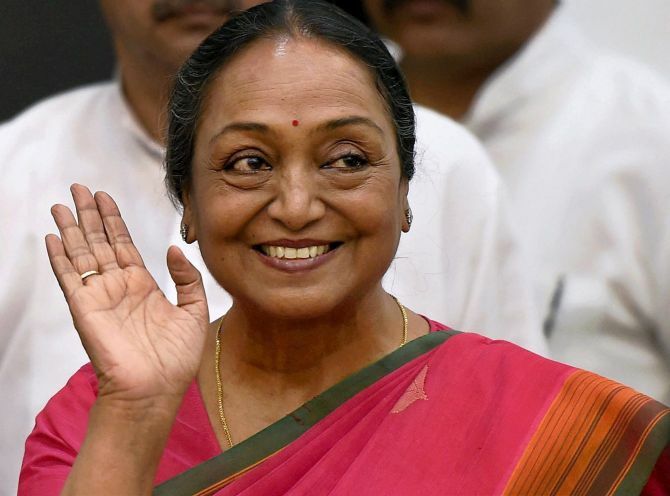 Opposition presidential candidate Meira Kumar on Tuesday said she would contest the election on the basis of ideology not caste, stressing that her plank would be destruction of the caste structure and protection of democratic values. Kumar, who will contest against National Democratic Alliance’s Ram Nath Kovind for the post of president, described the presidential poll as a “battle of ideologies” and not a “Dalit versus Dalit” fight as was being out made out by some. The former Lok Sabha speaker is likely to start her campaign from June 30 from Sabarmati Ashram in Gujarat after scrutiny of her nomination. She will file her papers on Wednesday in the presence of top opposition leaders. Addressing her first press conference after being chosen as the joint candidate of 17 opposition parties, she said, “This unity is based on their firm ideological positions, democratic values, inclusiveness, social justice, freedom of press, transparency, end of poverty, destruction of caste structure as some of those cherished values which form an important component of this ideology. The fact that the election was being viewed as a contest between two Dalits reflected society’s mindset in her view. “I don’t want that this election for the top position in the country should be contested on the basis of caste. No countryman would want that. We are fighting this on the basis of ideology,” said the former diplomat and daughter of Dalit leader Jagjivan Ram. Never once was caste discussed in earlier presidential contests. What was up for discussion instead was the candidate’s virtues, eligibility and achievements. “But when Dalits contest, their caste is being discussed and their virtues become subordinate. So I can clearly see how society is thinking in 2017. On Union minister Sushma Swaraj’s releasing a video of a Lok Sabha speech to indicate how she was treated as leader of opposition, Kumar said leaders of various parties had never criticised her for her style of functioning but appreciated it. “Even today in our country, atrocities are being committed on Dalits, the oppressed and weaker sections... my fight is against that,” Kumar added. She said she had not decided on whether to appeal to Janata Dal-United leader and Bihar Chief Minister Nitish Kumar to support her nomination. However, she had already reached out to each member of the electorate through her letter two days ago in which she made an emotional appeal to their “voice of inner conscience”. Kumar, also from Bihar, brushed aside charges of irregularities over a bungalow in Luytens Delhi being converted to a memorial dedicated to her father.